This integration allows you to add to your list of subscribers using forms made with FormCraft. You can also pass other fields, like name, address to your list using the forms. You need to enter your Authorization Code here. Follow the link on the page to get this code. Enter the code and click on Save. If the key validates, it will be saved. Create a new form, and add an email field and a one-line text field. 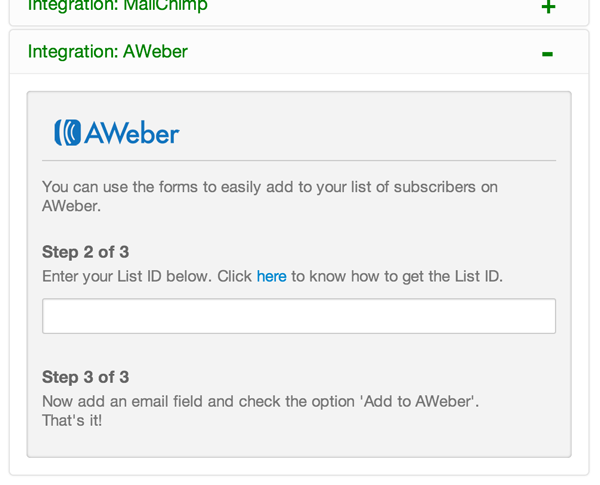 Go to Form Options -> Integration: Aweber. Click on the email field which was added in the form. In the field options, check the option Add to Aweber. Click on the other one-line text field and enter Name against the field Custom. This field will take user’s First Name as input.